Hey, y’all. Floridaborne here with another lesson on how to look like a Floridian. You need to know is how to choose your footwear wisely. We Floridians love a good joke; that’s why we’re so fond of Flamingo socks. It’s the perfect autumn accessory for your flip-flops (Unfortunately, autumn lasts about 2 weeks — a time when it’s between 70F – 80F). Then, when winter hits, thick thermal socks are best to wear. Be sure to look for moccasin’s, too. 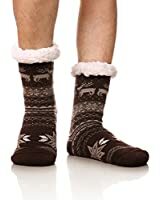 They go great with the wool socks. And if you get the socks a size larger, you can wear them with your flip-flops! If you’re not dressed like this when it hits 50F, everyone is going to know you belong in Siberia. So…now that you have the perfect understanding of how to be a Floridian, you’ve probably decided that a gated community in an upscale mobile home park for Snowbirds is the best way to “move” to Florida. There are some nice ones between Tampa and Ocala, where most of the hurricanes tend to hit. But never fear! With good insurance and a vow only to be here from November to April, you can miss the hurricane season and rebuild once it’s over. If you want to visit Florida instead of moving here, October, November, April and May are the best times. Few bugs, and it’s about 80F during the day. And the theme parks aren’t open crowded. Have fun, and remember to wear 100 SPF waterproof sun block (especially on your flip-flopped feet), or most of your visit may include the inside of a hospital. After reading this, I am not in any hurry to go and visit. Good choice. 🙂 Especially if you know a hurricane is coming through. I haven’t visited Florida since the Carter administration. Which is too bad; it’s a fascinating place. Time to plan a return!